I planned on making pizzas. I’ve never made pizza at home before but I like making dough so I thought it would be fun to try. It was a fun idea but after I made the dough, I got scared. All I kept reading about making pizza was about using a pizza stone – and I don’t have one! So… I lost my nerve. That’s why we had pepperoni calzones and not pepperoni pizza! I had already made the pizza dough using this pizza dough recipe. It’s a great recipe! The dough was beautiful to work with and even more important, tasted amazing! The calzone filling was easy. I used a bunch of ricotta cheese (3 cups probably), shredded mozzarella (maybe 1 cup), about 1/2 cup of parmesan, an egg, some fresh chopped parsley and voila, calzone filling! Oh yeah – I had pepperoni slices so I cut about a ton of them in half and mixed them in with the cheese mixture. 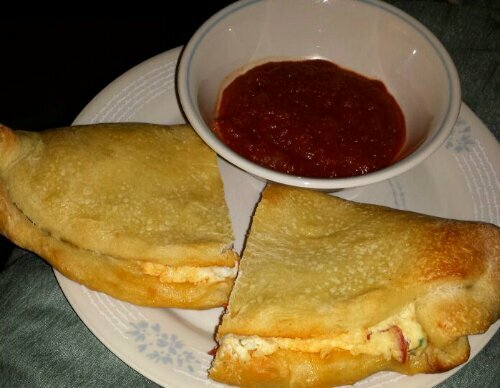 I made 4 large calzones and a side of Traditional Tomato Sauce to dip them in. 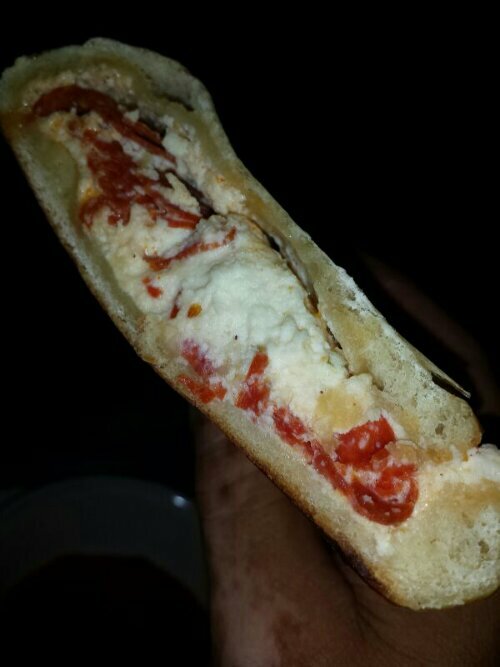 I’ve seen where people put the sauce in the calzone before they close it and bake it, but to me, that’s a stuffed pizza – not a calzone like I’m used to. I brushed them with an egg wash and baked them at 400° for about 25 minutes. They were so good! Everyone liked them… Yeah!